A WARTIME American fighter pilot who bailed out of his damaged Mustang aircraft over Jersey on 8 February, 1944, was reunited with one of his helpers yesterday. Lt. Joseph Krebs, as he was then, was returning from escorting a bombing raid on Frankfurt, and was heading back to his base in Essex when his engine froze up. Way off course and realising that he would not make it to the UK, he baled out in gale-force winds. He was fired at by German gunners, but after his parachute caught momentarily in a tree, he landed in a field at La Presse, St. Peter. Several people came rushing to his aid, including Mr. Alfred Godel and his daughter, now Mrs. Cynthia Renouf, who was milking cows in a nearby field at the time. Mr. Godel helped the then Lt. Krebs out of his parachute, and although the main chute was blown away he managed to retain the smaller "pilot chute" in the hope that he might one day be able to return it to the officer. Mr. Godel has since died, but the chute passed into the hands of Mrs. Renouf, who now runs St.. Mary's Post Office, and yesterday she was able to give it back to its rightful owner. But the reunion would not have been possible had it not been for Mrs. Margaret Ginns, a member of the Channel Islands Occupation Society. The man who rescued Lt. Krebs from his parachute, the late Mr. Alfred Godel. It was through her research into prisoners of war that she found out Colonel Krebs' present address in Alamo, Texas, and wrote a detailed article about him in the society's Occupation Review last year. She finally made contact, and Col. Krebs was delighted to be able to return to the Island for the first time in 43 years. 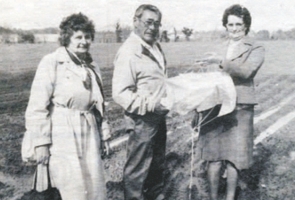 The parachute was returned to him by Mrs. Renouf in the field where he first came down at La Presse Farm, in the presence of Mrs. Ginns. "I did not realise what a beautiful Island it was, when I arrived the first time," Col. Krebs told the JEP. He said that he had longed to return after the war, but because of the help and assistance he had received from Islanders he feared they might have been punished by the Germans, or sent to concentration camps. And if any of their families had survived, he did not want to stir up memories from the past. "As much as I wanted to come back, I did not know there would be anyone left to thank," he said. But after a letter from Mrs Ginns last year dispelling all his doubts, he was delighted to come back. He told the JEP of his eventful but short visit in 1944, when, after he baled out, his Mustang crashed near Chemin du Mou-lin, St Ouen. Col. Krebs fractured his shoulder and received severe neck injuries on landing, but felt himself lucky to be alive at all after parachuting in such strong winds. He said that not long after being helped out of his parachute, German soldiers arrived and took him to their headquarters in the west of the Island (now Les Niemes) for interrogation. But he did not give anything away, answering their questions in American slang which could not be understood by the interpreter. Col. Krebs was then taken to the Airport and searched, and where his shirt had to be cut off because his arm had swollen so much from the injuries. Lt. Joseph Krebs as he then was. Gloucester Street Prison (the site is now occupied by the Gwyneth Huelin Wing of the General Hospital) was where he was forced to spend his remaining days in Jersey, until he was moved to France and then transferred to a prisoner of war camp at Barth, in North Germany, where he remained until the end of the war. 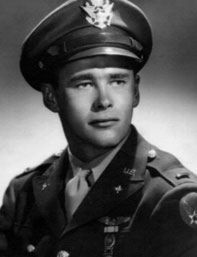 Col. Krebs, who is married with five grown-up children, stayed on in the American Air Force after the war, first as a military pilot until 1950, then in the reserve as a corporation pilot until his retirement in 1978. He returns to America tomorrow. Wartime American fighter pilot Col. Joseph Krebs went back yesterday to the spot where he was forced to land by parachute during the Occupation, and to recover a souvenir of that frightening experience. Col. Krebs is pictured here with Mrs. Cynthia Renouf (right) and Mrs. Margaret Ginns.